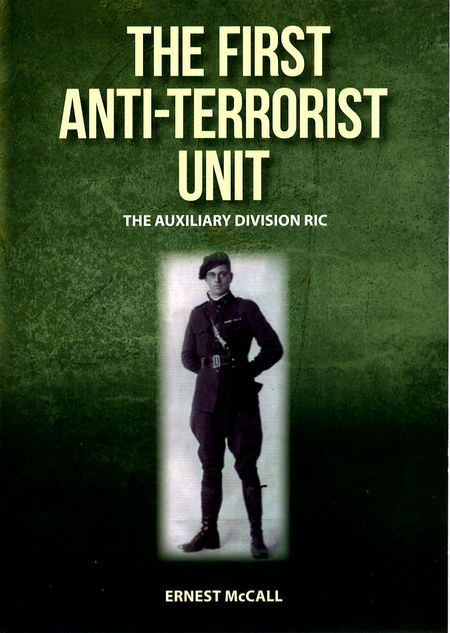 This is the new book (published April 2018) about the FIRST ANTI-TERRORIST UNIT, Auxiliary Division Royal Irish Constabulary, commonly called TUDOR'S TOUGHS, although they have been mentioned in many other publications this is the third dedicated book on this police division of the Irish war of independence period. The Auxiliary Division obtained it's nickname - TUDOR'S TOUGHS from the name of the Royal Irish Constabulary's Inspector General (Chief Constable) - Major General Henry Hugh Tudor. It details the known day to day events throughout Ireland in which the Auxies were involved, in fighting the terrorism of the Irish Republican Army (IRA). The Division was formed to fight the terrorism of the IRA and Sinn Fein and therefore became the world's first anti-terrorism unit. Many interesting facts are given throughout and the reader can relate to the duties of these exceptional men who took the fight to the IRA. It is a MUST HAVE book for those persons who are interested in the Irish war of independence and Irish policing. Those residents of Canada, Australia, New Zealand and the United States of America who wish to purchase this book please contact me via this website to ascertain postage rates for either airmail or surface. Residents of the European Union including the Republic of Ireland the cost of postage is at present (7/4/2018) £10.90. UK postage is £5.50 (1st class) and £2.95 (2nd class) The book cost is £25.00. IF YOU WISH TO BUY THIS BOOK CLICK ON THE BUY NOW LINK BELOW. PLEASE CHECK YOUR POSTAGE RATES ARE CORRECT FOR UK OR OUTSIDE THE UK. THE CORRECT RATES ARE LISTED ABOVE, IF IN DOUBT PLEASE EMAIL ME. TUDOR'S TOUGHS IS NOW KINDLE ONLY - see details below. This is the follow up book to TUDOR'S TOUGHS due to the excellent response I received about my first publication. There were many photographs that I could not previously use but I amassed more photographs from family members of the Auxiliaries and published the book in March 2013. This is a pictorial history of the Auxiliary Division from official, newspaper, private and family sources. Some of the ambush scenes have been revisited and the book has a selection of now and then photographs. I have been able to identify a number of the AUXIES from these photographs which brings the photo to life and puts a different light onto these men who faced a rough and dangerous task during the turbulent times of 1920 - 22 in Ireland. There are only 500 copies of this book published and in the region of 380 have been sold so far. As with TUDOR'S TOUGHS it is a MUST HAVE for those interested in this period of Irish history. The book is £25.00 plus postage - UK rates £5.20, Republic of Ireland £7.00 (due to weight) and all other countries within the European Union £8.05 (All other international buyers - please contact me to ensure you get the correct postal rate). If you purchase BOTH books together the postage rate is at present is for the UK - £9.60. For the Republic of Ireland and the European Union the cost is £13.85. (All other international buyers - please contact me to ensure you get the correct postal rate due to weight - Australia/New Zealand - Air Mail - £22.15, Surface Mail - £12.35). Postage rates as of 4/2/15. IF YOU WISH TO BUY THIS BOOK CLICK ON THE BUY NOW LINK BELOW. The photograph above and to the left are of an action figure in the uniform of a Sergeant, "F" Company, Auxiliary Division Royal Irish Constabulary stationed in Dublin Castle. The figure displays the distinctive yellow diamond patch of "F" Company behind the Harp & Crown badge on the Balmoral cap. Note the Sergeant chevrons on the lower right sleeve. The Royal Irish Constabulary and later the Royal Ulster Constabulary George Cross and now the Police Service of Northern Ireland were and are the only police force in the United Kingdom to display the Sergeant rank in such a way.